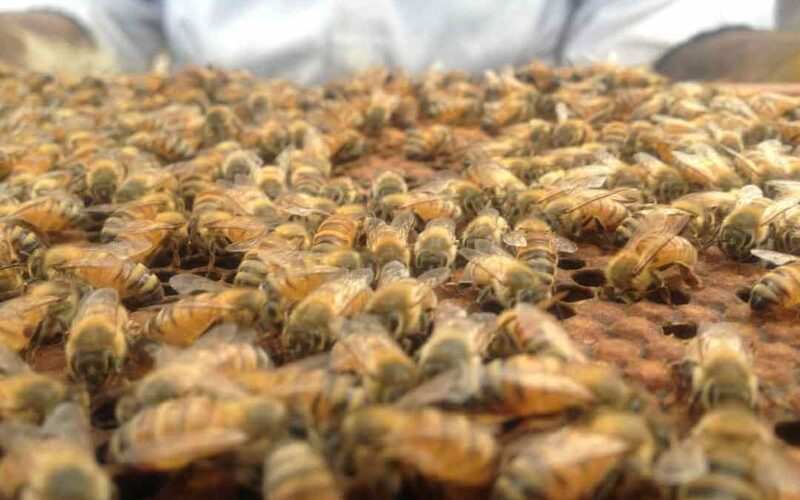 How Do Bees Care for Their Young? The queen lays an egg which hatches in 3 days, then the worker bee will be a larva for 9. At this point the larva spins a web in the cell, becoming a pupa, and the nurse bees seal the cell over with beeswax. The worker bee will emerge from the cell 12 days later. A queen bee goes through her life cycle in 16 days, a worker emerges at 21 days and the drone bee emerges from his cell at 24 days after they were laid as an egg. Bees care for their young in surprising and complex ways. The larvae develop in the brood frame, a special hive insert in modern hives, where the eggs are laid by the queen bee. The nurse bees watch over them in bunches. They contract their thoracic muscles to raise their body temperatures, if the temperature is cold, and thus maintain an ambient and constant temperature of 95 degrees Fahrenheit (35° C). In the brood chamber, the hive box where the bees raise the brood, there are different colors of pollen in cells, the protein that is indispensable to the baby bees growth. Nurse bees will visit an individual larva 10,000 times before it is capped as a pupa. The last day before the larva becomes a pupa it will be visited 3,000 times, which is approximately four hours and 45 minutes. The colony consumes 66 to 88 pounds of pollen per year to raise the brood. The bees also store honey around the brood. Once the queen lays an egg the nurse bees start taking care of it. The egg will hatch in 3 days, at which point it is fed royal jelly. No matter what type of bee the larvae will become—queen, drone or worker—it is fed royal jelly for the first few days of life. If that larva is to become a worker bee, she is fed “bee bread” (see below). Feeding a potential worker bee the bee bread actually stunts her growth so that she doesn’t become a queen bee. If the larva is to become a queen bee, she is fed royal jelly (a milky, nutrient-rich secretion) the entire time she is developing. The royal jelly allows her to grow larger and develop fully so she is able to lay eggs. Before the bees feed pollen to the brood, they will mix it with honey and water, making bee bread. They let the bee bread start to ferment which opens up the granules of pollen, making it easier for the brood to digest. At this point, the bee bread is then fed to the brood that is to become the worker and drone bees. When you look through the brood chamber you will find varying colors of pollen on the outside of the brood, or the bees may make a full frame of pollen. It is like a patchwork quilt with the different colors of pollen. The interesting thing about honey bees which makes them the perfect pollinators is once a honey bee goes to a particular floral source she will only go to that type of flower until she has enough nectar and pollen to go back to the hive. Once the bee in the hive takes the nectar and pollen from the forager bee, she will put the nectar in a cell to be dried out, and she will put the pollen in a cell with the same floral source of pollen. As a platform for how bees care for their young, the beehive is an incredibly complex and delicate ecosystem requiring numerous inputs and outputs for the brood to survive. This includes mixing and providing an exactly correct solution of nutrition for each stage of bee brood development, including for a new queen.